In the fall of 1959 Bixby had just gone through its second major flood in less than three years. Heavy damage was done to many businesses, homes, the schools and the highway. The state and national media carried pictures and stories of the flooding. Some residents moved away form the community. Many of those who stayed were discouraged and downhearted, in need of something positive to rally around. That something was provided by an idea from Bill Hulen. 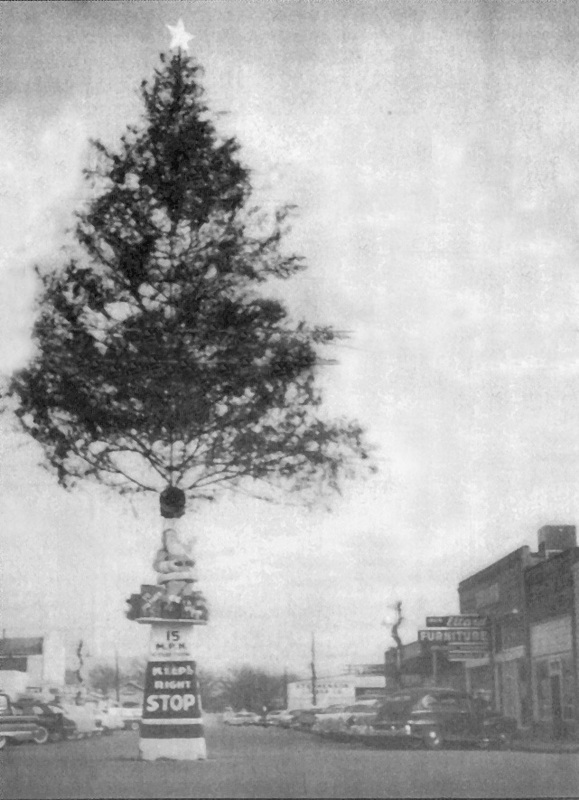 At a Chamber of Commerce meeting Hulen proposed that the town construct a Christmas Tree on the flagpole in the center of town and to make it the “tallest Christmas tree in Oklahoma.” At first there were all the reasons why it could not be done . . . money, time, manpower, materials . . . but gradually others began to get interested and excited about the idea of “The Tree.” Each obstacle was overcome. The idea, whose primary objective was to show some positive publicity for Bixby after all the negative flood coverage, soon expanded into much more than a “publicity stunt.” It became a focal point, a project that spread to include the entire town. Metal brackets were designed and made to hold the individual branches that went into making the composite tree. Approximately 300 people formed a caravan of cars, pickups and trucks on a chilly Sunday morning to a farm near Tahlequah. There they cut branches and loaded them to bring back to Bixby. Both young and old joined in the day’s activities that included a brief Sunday Service, and a huge wiener roast as well. When the Tree was completed, it stood approximately seventy-five feet tall with a three foot star at the top. On the night the Tree lights were turned on, the downtown area was packed with people. The high school band played Christmas music and people joined together to sing Christmas carols. That Christmas, in 1959, was thought by many to have turned out to be the best in the history of the town. People drove from miles around to see Bixby’s Big Tree. The town did receive the positive press it wanted from the media. Bixby’s giant Christmas tree on the flag pole became an annual event for several years. However, none topped that first year. That first year was when citizens closed ranks and worked together to not only chase away the “flood blues” but also to find the true spirit of co-operation, Christmas and community.